Mid-Coast Maine’s climate reminded Jan of his boyhood village on Holland’s North Sea. After working as a landscaper in the busy Baltimore-Washington area for over 35 years, he was tired of traffic and long commutes and missed bike rides, sunsets and walks on the beach. For Rosemary, the move from Maryland brought her closer to her French-Canadian father’s roots in Fort Kent on Maine’s northern border. After 25 years in corporate communications, PR and conference planning, she too longed for a more healthy, stress-free yet creative lifestyle where she could be outdoors and work with her hands. Ready for a change, but not ready to totally retire, the Blue Tulip is the couple’s dream come true. 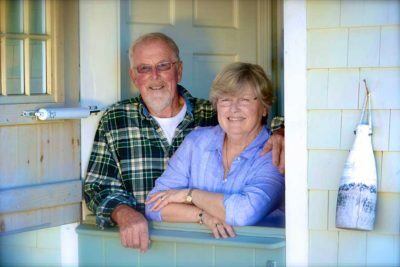 Since 2007 they have rebuilt their cottage, built a barn, started three businesses, reclaimed overgrown lawns, cleared dead trees and thickets from their 2.4 acres, and opened up views of their pond, Tenants Harbor and the nearby Camden Hills. Jan manages the couple’s Tenants Harbor Landscaping Services. Rosemary takes care of Lodging. Together, they share responsibility for selecting merchandise, designing displays, marketing and operating their Blue Tulip Garden Boutique. “The name seemed a natural outgrowth of Jan’s heritage, landscaping experience and years working in Holland’s bulb fields,” explains Rosemary. “Blue tulips are rare. In fact, most ‘blue’ varieties are more purple than blue. And that’s the point. We hope customers find our Maine-made products and services to be as distinctive and unique as that hard-to-find blue tulip.